Recently, my husband and I have decided to put rice, pastas, and bread aside. We wanted to implement more vegetables and proteins into our diet instead. At first, I was a bit intimidated…How am I going to cook 3 meals a day without rice, pasta, or bread?? I accepted the challenge and to be honest it was fun to channel my creative side and it feels good to eat healthier too. That is where these zoodles came into play. I went out and bought a Veggeti at my local Walmart which is a device that makes vegetables into a noodle like shape and it did exactly that for the zucchinis for my pasta. Unlike pasta though, zucchini isn’t cooked in water because it is full of water itself; instead its cooked in a little olive oil for 5 minutes or so without salt. Pesto is our favorite pasta sauce; there is just something about herbs and cheese mixed together that just tastes amazing. I usually make my own pesto but since I already had some store bought in my pantry; I decided to go with that. I was pleasantly surprised how yummy this dish was and quite filling. This is definitely a healthy alternative for our usual heavy pasta dishes. First, you want to prep your vegetables. 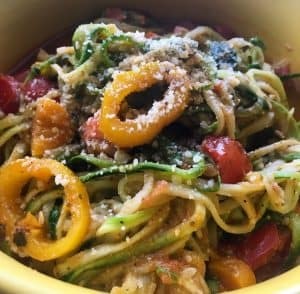 The easiest and best way to make zucchini noodles (zoodles) is to use a spiralizer (veggeti) which will give you long curly noodles in no time. You don’t want to peel your zucchini so it maintains a crunch rather than mushy texture. Also, don’t salt your zucchini but rather salt your sauce because the salt will draw out the water from the zucchini. Dice your tomato and bell pepper as well. In a sauté pan, add 1-2 tablespoons of olive oil on low-medium heat and cook your bell peppers along with the tomatoes with the addition of the minced garlic. In another non stick sauté pan or cast iron skillet; add the rest of your olive oil to medium heat and cook your zoodles. Consistently toss them in the skillet to ensure even cooking till they are al dente which takes about 5-8 minutes. Try not to overcook the noodles in order to avoid mushiness. In a small bowl, add you pesto sauce, red pepper flakes, garlic powder, salt & pepper and tomato paste. 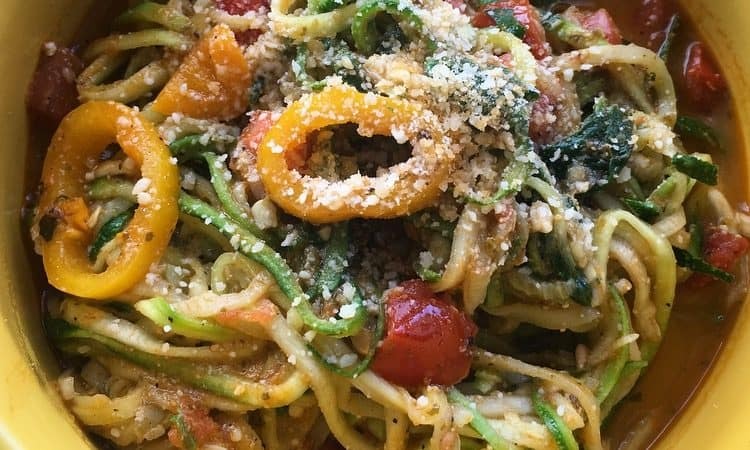 Mix it all together – this will be the sauce for your zoodles. Add this sauce to your zoodles after 5 minutes of them cooking as well as your pepper, tomato, and garlic mixture. This would be the time you would add the Parmesan cheese as well. Toss it all together for 2 minutes and you are done! Garnish with a little more Parmesan and you have yourself a beautiful & tasty dish. Previous Post Pumpkin Smoothie – All things Fall! Next Post Hummus – Middle Eastern Style!